community will inevitably have multiple political consequences. The term ‘Ocean Acidification’ is not a scientific term. It is a term used to scare and frighten. The correct scientific term is ‘less alkaline’. IPCC and alarmist claims that ‘ocean acidification’, causing harm to corals due to increased human CO² concentrations in the ocean, are completely unsubstantiated by empirical evidence and peer-reviewed science. Corals evolved during the Cambrian Era six hundred million years ago, with CO2 levels 4000% of what they are now. They are made of Calcium Carbonate (CaCO3) – and could not exist without substantial amounts of CO2 in the atmosphere. Unless the chemical properties of CaCO3 have changed, the corals will be just fine. Takahashi, A. and Kurihara, H. 2013. Ocean acidification does not affect the physiology of the tropical coralAcropora digitifera during a 5-week experiment. Coral Reefs 32: 305-314. The authors write that “according to the IPCC (2007) models, atmospheric CO2 is predicted to rise to 540-970 ppm by the end of this century and reach a maximum of approximately 1,900 ppm when the world’s fossil fuel reserves are fully exploited,” while noting that “a substantial number of laboratory studies have suggested a decline in coral calcification with a rise in seawater pCO2.” However, they say that recentstudies “have postulated that the sensitivity of corals to elevated levels of CO2 is potentially more diverse than previously considered,” citing the works of Fabricius et al. (2011), Pandolfi et al. (2011) and Rodolfo-Metalpa et al. (2011). Intrigued by these new and diverse findings, Takahashi and Kurihara measured the rates of calcification, respiration and photosynthesis of the tropical coral Acropora digitifera – along with the coral’s zooxanthellae density – under near-natural summertime temperature and sunlight conditions for a period of five weeks. Another CO² scare flops. The IPCC alarmist predictions about harm to corals from CO² are unfounded. Again, nature is not cooperating with the IPCC’s fear-mongering. A WIDESPREAD belief that the world’s coral reefs face a calamitous future due to climate change is proving less resilient than the natural wonders themselves. Rising sea temperatures, storm damage and ocean acidification have grabbed the headlines as looming threats to reef survival. But as each concern is more thoroughly investigated, scientists are finding nature better equipped to cope than they had imagined. There’s an interesting study out on the natural pH changes in the ocean. I discussed some of these pH changes a year ago in my post “The Electric Oceanic Acid Test“. Before getting to the new study, let me say a couple of things about pH. The pH scale measures from zero to fourteen. Seven is neutral, because it is the pH of pure water. Below seven is acidic. Above seven is basic. This is somewhat inaccurately but commonly called “alkaline”. Milk is slightly acidic. Baking soda is slightly basic (alkaline). Figure 1. pH scale, along with some examples. 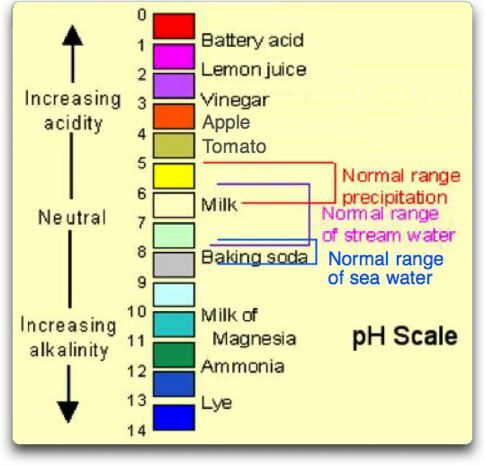 The first thing of note regarding pH is that alkalinity is harder on living things than is acidity. Both are corrosive of living tissue, but alkalinity has a stronger effect. It seems counterintuitive, but it’s true. For example, almost all of our foods are acidic. We eat things with a pH of 2, five units below the neutral reading of 7 … but nothing with a corresponding pH of 12, five units above neutral. The most alkaline foods are eggs (pH up to 8) and dates and crackers (pH up to 8.5). Heck, our stomach acid has a pH of 1.5 to 3.0, and our bodies don’t mind that at all … but don’t try to drink Drano, the lye will destroy your stomach. “C3 Headlines” page: Full list of Peer-Reviewed studies and research that puncture the hot air balloon of CO²-centric ‘coral bleaching’ and ‘Ocean Acidification’ alarmism. MUST SEE : US SENATE ENERGY, ENVIRONMENT & TELECOMMUNICATIONS CMTE – Climate Change – Dr Don Easterbrook – Easterbrook discusses the latest climate data and the ‘Ocean Acidification’ myth, under oath in a US senate committee hearing. 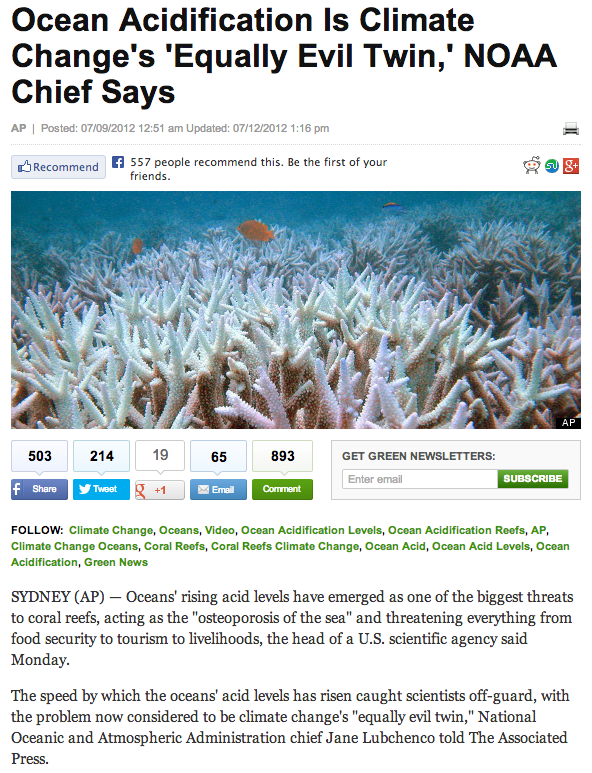 Good news about coral reefs – they recovered from warming | Watts Up With That? Now that the Arctic sea ice scam has collapsed, as far as I can tell every single Hansen et al alarmist prediction has failed miserably. This is by far the biggest junk science incident in history. Ten years from now, people like John Cook will be publishing fake papers claiming that scientists never believed in global warming. It was all media driven, but scientists always knew that solar activity drives the climate.